I lived in Phoenix, AZ my whole life and there was not much of a seasonal change. Texas has given us a new perspective on truly having four seasons each year and lots of day-to-day change in between, too. As most of you know, we downsized last year and decided to intentionally simplify and minimize all aspects of our lives. This season of downsizing has lasted longer than we anticipated. We have two choices, though. We can dwell on the fact that we don't have the ideal spaces that we want and let that ruin our current experiences. Or we can be content in our current season, knowing that we are striving for change. And as we all know - change is inevitable. As spring approaches and my secret dreams of living on a farm here in Texas are pushed back, we decided that a little herb garden at home would fill that void, and still allow us to celebrate the season. 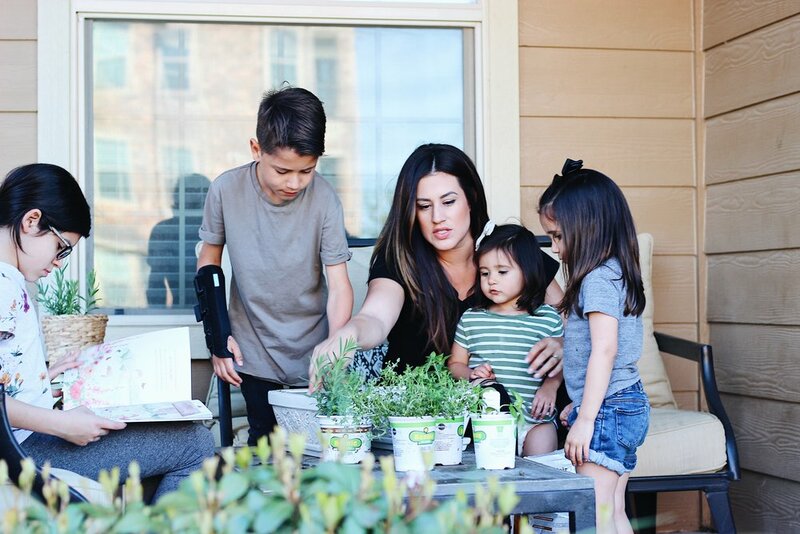 We headed to the store, bought some supplies and spent a morning planting our own herbs, and reading our new book by Joanna Gaines, We Are The Gardeners. We got Basil, Mint, Rosemary and English Thyme. All perfect for some of our favorite recipes! Our little patio will house our new herbs, perfectly placed close to the kitchen so we can use them as we cook. If you haven’t done so yet, download the cutest, FREE, spring printables from Magnolia HERE.